Recently G-Form released its latest protective case for original iPad and iPad 2: Extreme Portfolio. Need an extreme protection? Let’s go on checking. G-Form Extreme Portfolio is a folio styled protective case designed for both original iPad and iPad 2. 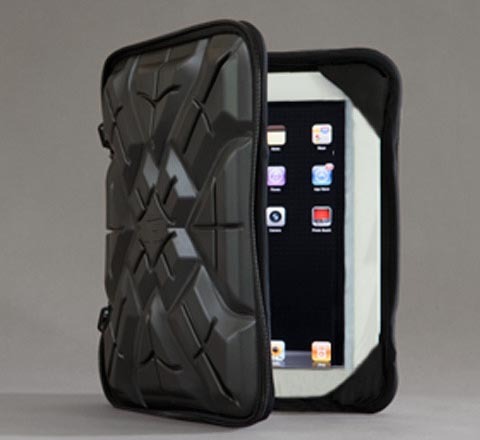 Similar as other G-Form protective sleeves, Extreme Portfolio utilizes Reactive Protection Technology (RPT), and features a combination of PORON XRD material and G-From technology and design, plus the internal layer of polycarbonate in order to protect the iPad or iPad 2 from bumps and scratches. And as we can see from the image, the RPT corners can ensure the device securely in place. When the front cover is flipped back, the iPad case will double as an iPad stand to hold the iPad in portrait or landscape viewing mode. G-Form Extreme Portfolio protective case is available in two colors, including yellow and black. Each one is priced at $79.95 USD. If you’re interested, jump to G-Form official site for more details.